Update: Text below is now out of date. 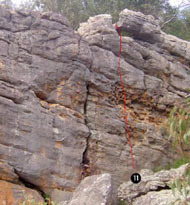 Visit http://www.climb.org.au/index.php?page=26&crag_id=83 or Download the PDF for latest version. 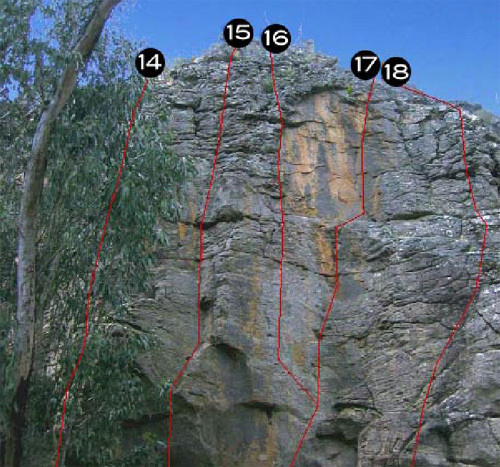 This guide records the new development that has occurred in the hidden crags within walking distance of the Mt Stapylton Campground, Northern Grampians in Western Victoria. 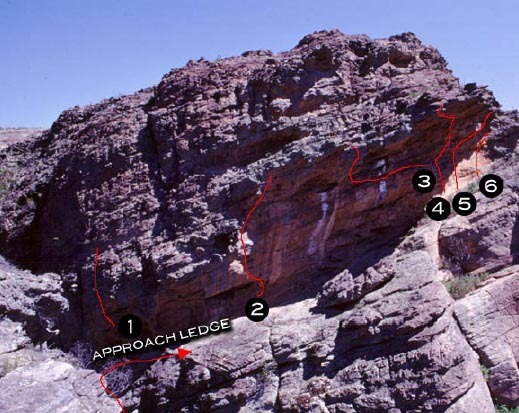 Most of the better routes are steep bolted sport routes which are marked with (S). 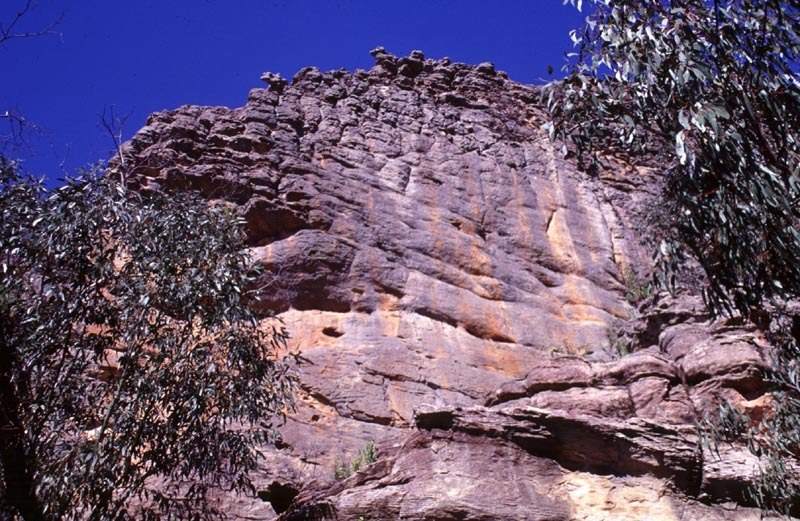 The rock is coarse with a similar feel to the Blue Mountains and has patches of utter choss. If you are climbing on trad then take extra care as many of these routes have had limited repeats. 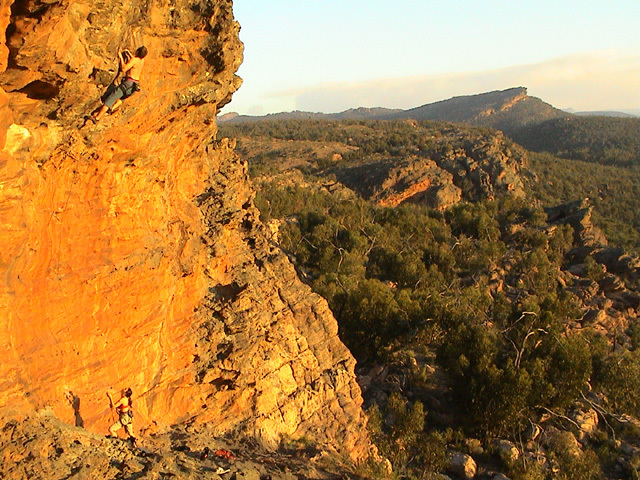 If you want to clip bolts then this area is a great place to start your Grampians experience. Leave your bolt plates at home - almost everything here is ring-bolted. 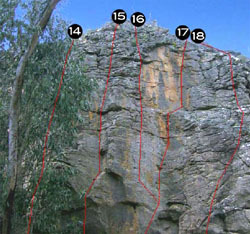 To locate these crags from the car park refer to the map. Access: 15-20mins, Late afternoon sun, Rain protected. This is a large cave of excellent rock high up in the valley behind Stapylton Campground with an easy flat walk-in. (See: detailed approach map of walk-in). 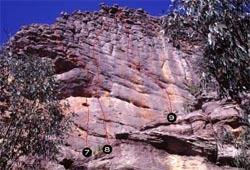 Hidden amongst vast amounts of choss this area features very steep sport routes on coarse orange rock. From the Mt Stapylton Campground aboriginal shelter car park walk south east following the east side of a vegetated creek. A few minutes into the walk you will pass an isolated pillar of rock ‘castle crag’ with a few ok routes on it. Keep following the creek, walking along nice kangaroo grass and ferns for ten minutes until you can see a red cave above some large walls up and to the left. Try and locate some rock cairns and follow these up gentle hill. Follow left branch of ‘creek’ up small rock gully on the left side of the cave until you can traverse directly right across exposed rock to get into the cave. 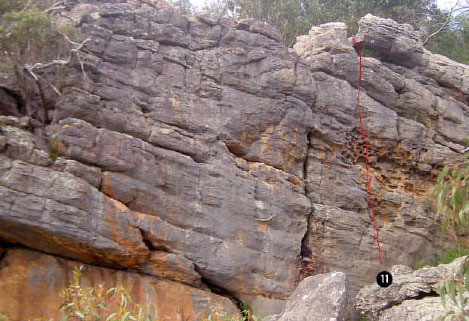 A RB is positioned at the end of this traverse to use as an anchor to belay people who may be scared of the traverse. 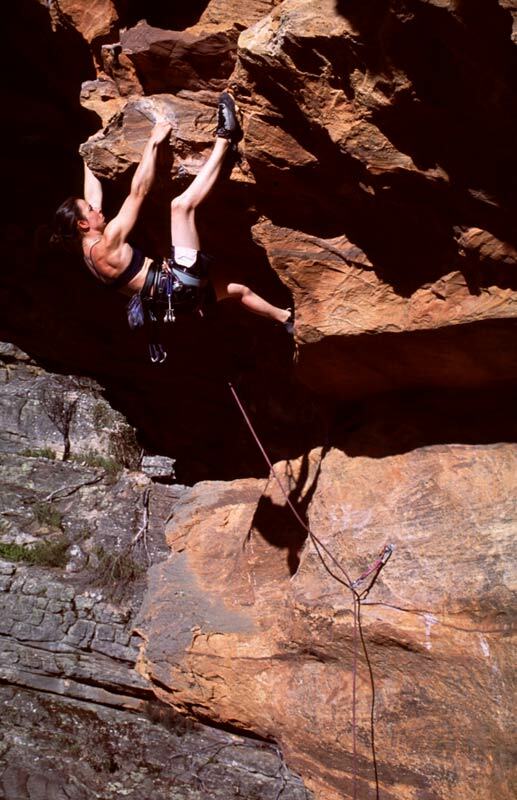 It can also be used to abseil out of the cave when the traverse is wet from rain. Right: Jacqui Middleton on the lower moves of the very steep Army of Ants (27). On the other side of the access gully is a rock buttress. About 100m left and slightly uphill from the cave is this orange wall with large horizontal pockets. 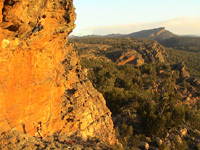 Scramble onto large ledge from the left side to belay. Right and slightly downhill from Sunraysia is this wall with some obvious crack lines. A small gently overhung amphitheatre of rock with a couple of good Blue Mountains style sport routes and plenty of potential for new routes. The orange wall is clearly visible on the hillside when driving in from the highway past the olive grove. 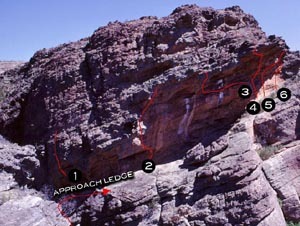 Walk in as for Sentinel Cave (see: detailed approach map). After hopping over a big dead tree about 8 minutes into the walk turn left and follow small creek bed steeply uphill heading for the obvious orange wall high on the hill. Scramble up ledges and small fixed rope to get to base of wall. Above Left: Topo of the Guardhouse. 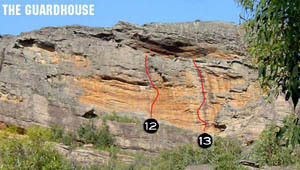 Above Right: Neil attempting the second ascent of Little George (22). Named after George the baby gecko, that hitched a ride on a backpack all the way to Brunswick... causing havoc at Jac's place for two weeks before being returned to the Grampians! 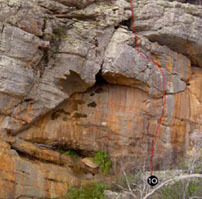 Follows left-trending line of four ringbolts in centre of crag just right of big scoopy hueco in rooflet. Stroll through delicate start just left of first bolt, locate the secret hold, and march your way to glory over steep juggy terrain. Double RB lower off. FFA Jacqui Middleton, Neil Monteith 25.04.2003. Check out the video clip Little George (3.3 Meg, 53 seconds) - In the setting sun, Jacqui Middleton grabs the FFA. Jac's smooth, leisurely pace appears more dynamic in this footage edited to reduce file size. Access: 6 minute walk-in, Afternoon sun. Small featured wall on left side of track about 100m past Castle Crag on the walk in to Sentinel Cave. 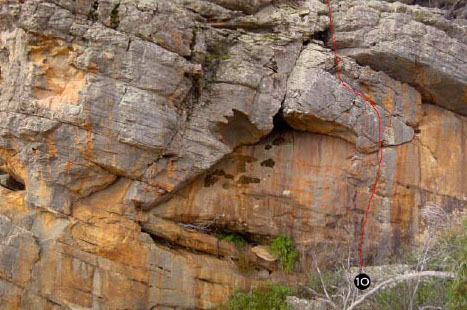 These are short trad routes on good rock. Best access to top as well as an easy down climb.